and effective. In order to make a quick kill, the hunter must be proficient with his firearm or bow, understand their personal effective range, and have an understanding of basic bear anatomy. Hunters must understand that bears are built differently than deer and other big game animals. The chest of a bear is compressed compared to that of a deer when looking at it from the side. A hunter who shoots ahead of the front shoulder may miss the animal, or worse, injure the animal with little chance of recovery. While either a broadside or quartering away shot is an excellent shot opportunity for a firearm hunter, an archers’ best shot opportunity is a broadside shot. The broadside shot requires less penetration for the arrow to reach the vital organs. 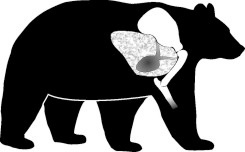 Wait for the bear to step forward with the near side leg exposing the heart/lung area. A bear’s most vital area is an 8” circle behind the front shoulder. Since bears have massive, muscular shoulders and heavy bones, a shoulder shot is not recommended. Head shots are not recommended either since a bear skull is very dense and its blunt, rounded shape can cause bullets or arrows to glance off ineffectively. When hit, a bear will generally run, perhaps for miles before dying if a good shot is not made. 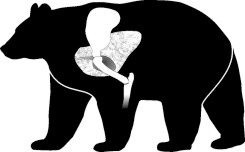 Additionally, bears have heavier bones, hides, and fat layers than many other game animals. 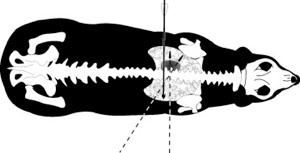 All of these features may inhibit blood dripping to form a good blood trail, making an injured bear difficult to track. Therefore, proper shot placement is essential. Shots should not be taken at a bear that is not clearly visible or positioned in such a way that does not present the vital area. Learn more about booking a trip Bear Hunting in Ontario at Shooting Star Camp.